SALT LAKE CITY: A flatbed truck carrying hundreds of beehives overturned near a construction zone on a Utah highway, freeing millions of bees and forcing authorities to temporarily close Interstate 15, officials said on Monday. "The driver lost control, hit the concrete barrier and rolled over. Of course, we then had bees everywhere," said Corporal Todd Johnson with the Utah Highway Patrol. The highway in southern Utah was shut down for several hours on Sunday evening and Monday morning, officials said. Local beekeepers worked through the night to gather the escaped bees. Officials said there was a net over the beehives but bees still managed to escape after the truck overturned. The truck driver and two law enforcement officers responding to the accident were stung by bees but the stings were not life-threatening, Johnson said. "There were about 450 colonies on the load and probably about 45,000 bees to the colony," said Richard Adee with Adee Honey Farms in Bruce, South Dakota. That would translate to more than 20 million bees. 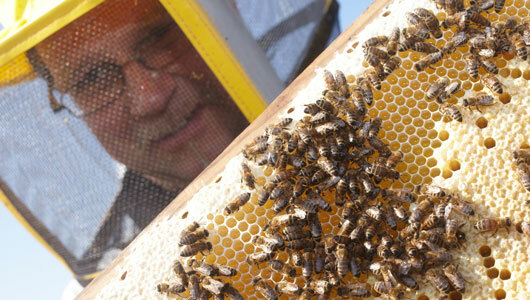 Adee said the bees were headed to Bakersfield, California for almond pollination next spring. "We stacked the equipment back together, put them back on trucks and trailers and whatever we could find to move them out of there," said beekeeper Melvin Taylor of Santa Clara, Utah. "Then we tried to move them as far out of the metropolitan area as we could. Because when those bees come alive today they are going to be mad that their house is all (broken) apart," Taylor added.